Posted July 4, 2018 by Lanie Tindale & filed under City Hub. Two dangerous WestConnex dive sites have been dumped by Lendlease, the lead contractor appointed to build the Stage 3 WestConnex tunnel between St Peters and Haberfield. This is a big win for residents but leaves open a serious question. Why were these two sites approved by NSW Planning in the first place? For two years, residents’ group Leichhardt against WestConnex (LAW) relentlessly campaigned against a dive site on Darley Road, where a Woolworths liquor outlet currently operates. They were quick to remind NSW Roads and Maritime Services ( RMS) that there had been fatal accidents on the road. Indeed, the intersection had been ranked the third most dangerous in the Inner West. They exposed questionable dealings around its acquisition. Despite 5000 submissions and consistent opposition from Inner West Council and independent experts, Sydney Motorway Corporation Project Director Peter Jones was adamant that the site was needed. So compliantly, the NSW Planning advised the NSW Planning Minister Anthony Roberts to approve the SMC’s choice of the site. By doing so, they exposed the taxpayer to a multi-million dollar compensation payout, scores of residents to round the clock construction noise and school students using the nearby light rail station to danger. Some residents chose to sell their homes rather than be exposed to health and safety risks. Suddenly the site is no longer needed. “This turn around calls into question the expertise of the SMC engineers. How could they get it so wrong? Why did Planning approve the site despite expert opinion and overwhelming community opposition when it turns out the site was not required?” asked LAW spokesperson Catherine Gemmell. Despite dodging the WestConnex bullet, LAW has made it clear that are concerned about other affected communities and will continue to support the campaign to halt WestConnex. The choice of an old Parramatta car dealer site in Haberfield as an option for a 24 hour dive site was equally absurd. The proposed site was only 150 metres from Haberfield Public School and far less than that from a childcare centre and hundreds of residents. The school is currently about 200 metres from a WestConnex construction site and in March, a monitor on the school grounds recorded the highest particulate matter ( PM) 2.5 average readings of any air quality monitor in NSW. One week before NSW Planning secretly approved the site as a potential dive site, the school was buried in dust after a wind storm raised PM 10 levels to an average of 200 u/gm3. Although Haberfield PM levels were substantially higher than anywhere else in the region that day, the SMC tried to blame the storm on a ‘regional event’ rather than a failure to control construction dust. There are no safe levels of particulate matter which is a known carcinogen and can cause heart and lung disease including asthma. The dive site option has now been dropped but the Haberfield community will still be exposed to congested tunnel exits, unfiltered ventilation stacks and dive site a few blocks away. The site nearer the school will be used for what SMC calls ‘low impact’ construction activities. The underlying question is who drove the decision to devastate densely populated areas for a transport solution that even Westconnex’ own EIS finds will deliver more traffic congestion? What powerful interests lie behind SMC’s determination to undertake activities that so many others consider unsafe? Why is it that a preliminary concept was approved for Stage 3 including an underground interchange at Rozelle of a sort that has never previously been built and for which the NSW EPS advised that the impacts had not been sufficiently investigated? Are NSW Planning senior staff exercising independent judgement or just following the will of their LNP bosses? The good news is that the public will hopefully be able to discover more about the internal secret processes that enable Premier Gladys Berejiklian and her cabinet, NSW Roads and Maritime Services and NSW Planning to make these decisions. 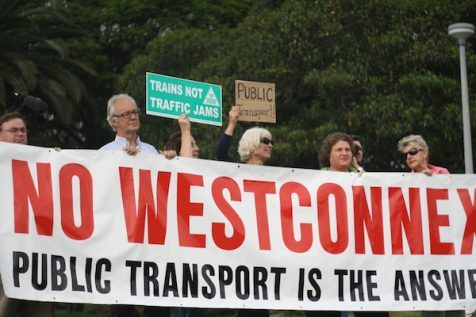 On June 21, a parliamentary inquiry into impacts of WestConnex was announced, It came after months of Greens MPs Jenny Leong and Jamie Parker working behind the scenes to get an Inquiry into WestConnex with strong terms of reference. While Jenny Leong’s earlier People’s Inquiry held in NSW Parliament House exposed stories of hardship and conflicts of interest in the governance of WestConnex, it had no power to call for documents or for witnesses to appear for questioning. This Inquiry will have those powers. The Inquiry will be conducted by the recently established Public Accountability Committee. Its terms of reference include an inquiry into the disappearance from WestConnex of the Sydney Gateway from St Peters to the Kingsford Smith Airport? What led to the SMC to quietly drop what was supposed to one of the key rationales behind WestConnex? What were the circumstances in which Lendlease was asked to work on the Sydney Gateway as a separate tollway? Who suggested that it should prepare an unsolicited bid to build the Gateway? The Inquiry should be able to penetrate the secrecy around SMC that has shielded the project from scrutiny for too long. After SMC was privatised, its contracts were no longer public. Public money has been used in grants to school and other community groups on terms that can effectively mute community debate. Tunnel exits and whole sections of tollway costing billions of dollars have been added or dropped from the project without any clear explanation being provided. “I hope that many in the community impacted by this polluting tollroad will feel some sense of relief with news of this inquiry today – knowing that their knowledge about the failures of this process, the negative impact on our communities and the questionable processes will now be scrutinised,” said Ms Leong in a media release. Premier Gladys Berejiklan will be holding her breath, hoping that she can push the 51 per cent sale of SMC through before the Inquiry uncovers too much unpleasant political news or scandals. There are only two bidders left standing – Transburban and IFM investors. Overseas bidders have already withdrawn. Both these bidders are backed by big Australian industry superfunds. Hundreds of letters have been written to the Boards of these funds calling on them to reconsider investing in a project that even industry insiders describe as ‘toxic’. The Inquiry is a long awaited for opportunity for the critics of WestConnex. If Jenny Leong is right, Westconnex could well be about to become even more toxic. Wendy Bacon was previously the Professor of Journalism at UTS. She is a Greens supporter and anti Westconnex campaigner.